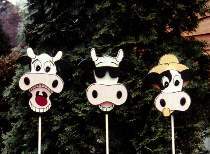 Three humorous Holsteins are at home in any garden or yard. 8"-9" heads mount on 1/4" fiberglass dowels. You get FULL SIZE patterns for all three projects pictured.